My visit to the Ukraine with Pastor Peter Cotton and his wife Nadia was both exciting and educational. Below are some pictures and comments concerning that visit. I urge you to pray for the people of Ukraine and for the LORD'S people working there, for God's blessing upon the preaching of his word. Ternopil where we were based is a lovely town, the people were friendly and courteous. There are no atheists in Ukraine, all sincerely believe in God, but many, many so sincerely wrong. There are churches everywhere, Greek Orthodox and Catholic mostly. We visited a number of them, saddened to see so many people with a devotion that would put Western Christians to shame, a form of religion without the power. Saints galore! St George, St Andrew and the original Santa Clause, St Nicholas. All routed firmly in pagan religion. Grace Church, Ternopil, the Evangelical Church where I ministered on the Lord's Day. Pastor Molodymyr and his wife. A Bible study was held in Lubba's flat where we were staying, about ten people in all. Two ladies responded quite positively. Lubba (Nadia's Mum), Auntie Nadia, Nadia and Peter. Independent Square, Kiev, the capitol city of Ukraine. The architecture is beautiful to behold. Another relic of the past, a statue of Lenin, the communist leader. I was surprised that it was still standing. Pastor preaching at the baptismal service held on the lakeside, where 120 people were baptised. The service was conducted very well, no entertainment or gimmicks, male and female choirs sang beautifully, God's word was proclaimed. There were hundreds of people who were there to witnessed the event. A relic from the past, the old KGB headquarters which is now a museum. 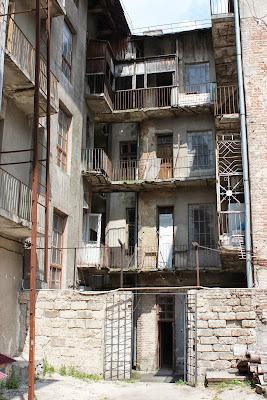 One of the cells where prisoners of the communist regime were held. Some were executed here, the diesel generator next door was turned up to kill the noise of the execution. Our guide who himself was a prisoner of the KGB. 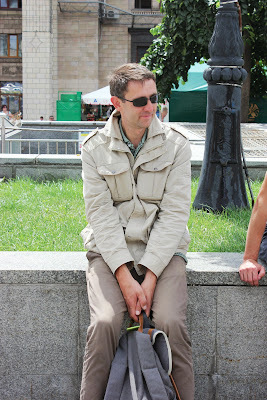 Peter in Kiev, ready for home.